All Jews married in Israel cannot remarry until a get, or writ of Jewish Divorce, is granted by their spouse in accordance with Jewish Law and irrelevant of their identification with any particular religious affiliation. This issue in the Diaspora affects only those Jews married in a halachic ceremony. Get-refusal is the situation that occurs when one spouse refuses to arrange a Jewish writ of divorce – the get. Get-refusal prevents a spouse from remarrying and building a new, stable family unit. For a woman, in particular, this is injurious since if she were to enter into another relationship, any children born of the new relationship would be considered mamzerim, unable to marry within the general Jewish community. Her biological clock is ticking with the get-refuser controlling her ability to have children. In Israel a man, as well, can be a victim of get-refusal with a wife refusing to receive the get. Get-refusal is the ultimate form of domestic abuse, a tragic form of spiritual and emotional imprisonment, for both women and men, which has social, economic and legal ramifications on the individual, as well as their families and communities. This program aims to target the issue before it arises, by educating all marrying couples, in particular the younger generation and all those who interact with the younger generation, on the importance of signing a prenuptial agreement, thus preventing get-refusal from taking root. The program also encourages already-married couples to sign a postnuptial agreement, and has initiated postnuptial signing events throughout Israel. For Agunot or those trapped in get-refusal, the program provides support to claim their freedom. This program assists all Jews of all religious backgrounds in all locations,and serves both men and women trapped in unwanted marriages. By educating the general public, Rabbis who officiate at marriages and authority figures on the important of signing pre-nuptial agreements; by educating and encouraging engaged couples and married couples to sign a pre(or post)-nuptial agreement; by influencing change within the legal system on the way divorces are handled – we are battling an issue that effects Jewish marriage and Jewish families at its root. The influence of this project is felt by those concerned with alleviating the anguish of difficult divorces whether on a personal or institutional level, in Israel and abroad. In addition, it provides a model for the betterment of women’s status, actively involving women in the judicial process including in the Orthodox stream, and has resolved specific cases which were heretofore considered lost cause. An Agunah is also a “chained woman” with different tragic circumstances. The Agunah status occurs when a man cannot give a get to his wife in the Rabbinical Court, as a result of running away, disappearing (without our knowledge if he is alive or dead), in a coma, or mental illness, for example. In this case the woman is truly trapped, since her husband is either not present physically or mentally and his active participation in the process is required. The result is a woman agonizingly trapped in an unwanted marriage. The work of the Agunah and Get-Prevention Program is continuous throughout the calendar year. Our efforts address a broad spectrum of needs – education, social activism, dissemination of information and providing much needed guidance and support for victims of get-refusal. Large-scale events encouraging already-married couples to sign the Agreement for Mutual Respect, and to educate and mobilize communities on the topic of get-refusal and pre-nuptial agreements as a preventative measure for get-refusal. Contact us to learn about upcoming events. Published halachic guidebook for laypersons and decision-makers currently available in Hebrew and to be translated to English in 2017/8. Adapting to the ever-changing needs of the Israel and Diaspora communities, to strengthen and protect the Jewish Family unit. 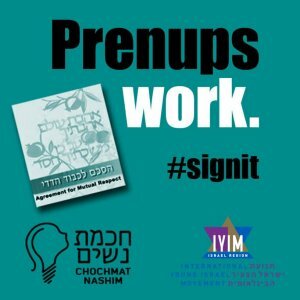 … have all presented the signing of a prenuptial agreement for the prevention of get-refusal for signing before marriage in their district, when their Rabbis perform the Jewish marriage ceremony. Help effect change in your municipality or local rabbinate. The success of the program over the past 16 years and its rise to prominence in this field led to Dr. Levmore’s appointment by then-Justice Minister, Tzipi Livni, to the national committee for the appointment for Dayanim (Rabbinical Court Judges). Dr. Levmore is the first officially sanctioned woman appointed to the National Committee for the Appointment of Rabbinical Judges – this is the highest level of influence possible within the legal system, and one which allows the program to affect all citizens of Israel After two years of intense work, the Dayanim were finally appointed in 2016. For the first time, a number of the Dayanim are graduates of Religious Zionist yeshivot and IDF service (this is ground-breaking, and a direct result of the work of this program) and this will influence how they settle divorce cases for generations as it leads to a more open minded Rabbinic leadership – in Israel where religion and state are intertwined thus defining how marriage and divorce occurs across all spectrums of society.